Control is based on Touching From a Distance, the book by Curtis's widow Deborah. Casting for the role of Curtis - who committed suicided in 1980 - will take place in the spring. The film is being made by director and rock photographer Anton Corbijn, who has worked with U2 and Depeche Mode. Peter Hook told NME they wanted to record new songs for the film as Joy Division. He said: "We were asked to do the soundtrack to the film, which I thought was a f***ing great idea - for Joy Division to do the music for a Joy Division film - because we've never really done a soundtrack before. "It may include new stuff. Anton wants to use songs by Joy Division so that each song becomes a video. Like the way the Atmosphere video was filmed, he wants to write videos that appear in the film." The Manchester band are also considering playing all Joy Division sets at future gigs.They played such a set at the October tribute concert for John Peel in London, including a rare outing for Warsaw. 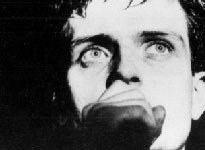 Hook said: "We have actually talked about doing Joy Division sets and gigs, but we haven't found our footing yet." Excerpts taken from BBC 6 Music. © Copyright 2005 NewOrderOnline.com, except the works of other authors. All rights reserved.